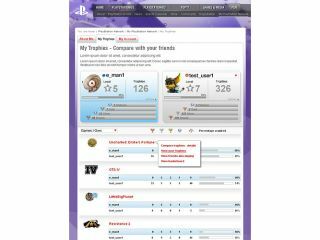 Sony's official website has ramped up its functionality and added some new features regarding your PS3 trophy cabinet. For the first time on the web, members of the PlayStation Network can go online to eu.playstation.com and compare your Trophy collection alongside that of your PSN Friends. Unsurprisingly, the new feature is called 'My Trophies – Compare with your friends'. Another new feature is a leader board, which for the moment is just available for you and your PSN compadres. There's no word but TechRadar is hoping that this feature will go global and include the option to compare yourself to everyone on the PSN at some point. The new aspects of the website are updates to the Portable ID section of eu.playstation.com. Back in March, the ability to check trophies and status updates was announced. Couple this with the new functionality and it seems that Sony is making all the right moves to integrate PSN into your daily lives – even when you are not on your PS3.